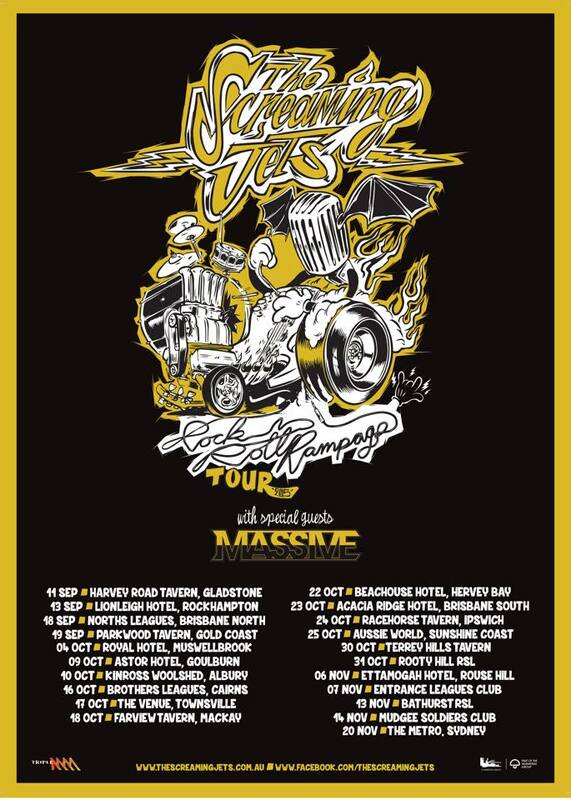 Aussie hard-rockers Massive have just announced that the band is going on an Australian tour as support for rock-legends The Screaming Jets. The tour starts off in September and running into November. In the same press release, Massive also revealed that their new album is finished, and that details will be released in the near-ish future. Read my review of Massive’s album Full Throttle. The Screaming Jets were formed in Newcastle in February 1989 by Paul Woseen, Dave Gleeson and Grant Walmsley. Drummer Brad Heaney and Richard Lara were then recruited to complete the original line-up. Over the next decade, The Screaming Jets clocked up more than 1500 live shows and released three Top 5 albums (All For One, Tear Of Thought, ‘Gorilla’) and ten Top 40 singles, including Better, Friend Of Mine, Helping Hand, October Grey and Shine On and Shivers. In the 2000s, The Screaming Jets released the albums Scam and Do Ya, and the EP Heart Of The Matter. And by hitting the road we really mean it. We are driving the entire trip. Google Maps estimates that we will drive about 22,500KMs over the course of this tour! These Road Doggs are coming to rock a town near you!!! Tix and info available from the Screaming Jets Website below!